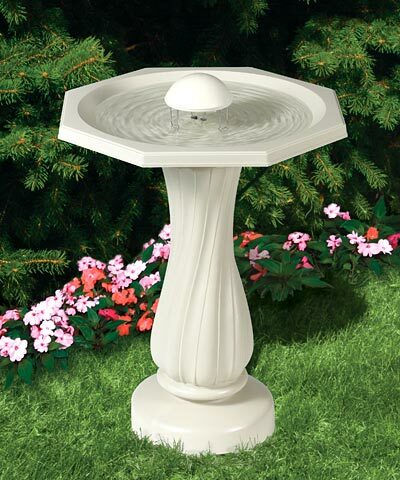 Prevent mosquito infestations while attracting birds to your yard with the Allied Precision Water Rippling Bird Bath. This elegant bird bath comes complete with basin, pedestal, and an Allied Precision Water Wiggler. The Allied Precision Water Wiggler features a unique agitator action that creates continuous ripples in the water. This rippling action creates enough surface movement to effectively prevent mosquitoes from laying eggs, while at the same time attracting more birds than a traditional standing bird bath. The wiggler operates silently on two D batteries for up to two months of 24-hour use. The bird bath itself features a unique octagonal shaped basin with a gently twisting pedestal pillar. The bath is crafted from resilient plastic and tested in sub-zero conditions to ensure that it will not crack. Batteries not included. Limited one year warranty.